Two options for savings are presented in this chapter. 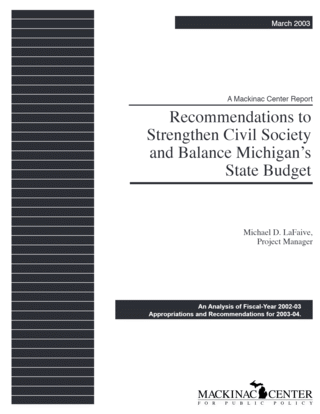 The first offers specific recommendations to the legislature on where to cut spending. The second option involves outsourcing management of the entire system, and the savings that could be achieved. Operating under Act 232 of 1953, the Michigan Department of Corrections (DOC) is the citizen’s agent for limiting the liberty of those convicted of violating the most serious of society’s legal standards of behavior. It does this through operating prisons and camps, and administering systems of probation (an alternative to imprisonment) and parole (supervision for a time after imprisonment), as well as other means of punishment. There are many crime prevention theories in the academic literature, and the department employs several of them, including incarceration, deterrence, and rehabilitation. It operates as guardian, tutor, physician and counselor to those under its charge. In addition to operating its own system of facilities, the department works with counties to deal with criminals who commit less serious crimes. Matching employers and prisoners through a computerized job-search system. The state’s correction system represents one of the largest components of state spending. Indeed, the state will spend over $1.7 billion operating the Department of Corrections during the fiscal year 2003. Only 2 percent of that amount comes from federal funds; 95 percent comes from the general fund/general purpose portion of the state budget, the area of the budget over which lawmakers have the most spending discretion. The Department of Corrections (DOC) was responsible for administering criminal penalties to roughly 1.2 percent of Michigan’s population, or 121,215 individuals as of Feb. 28, 2003. It operates 42 prisons and 11 camps (including one “boot camp”), which house over 86,000 prisoners. DOC employees monitor an additional 54,000 convicts through probation and another 14,000 through parole. The department also houses approximately 450 offenders in corrections centers (halfway houses) and supervises approximately 1,000 people through electronic monitoring (“tethers”). In an attempt to reduce the cost of building and operating more prison beds, the department contracts with counties to house certain inmates; in fiscal year 2001, it paid counties over $17.1 million to house nearly 4,700 offenders in county jails rather than state prisons. The DOC employs a large number of people — nearly 19,000 — to oversee this population. Roughly half of the department’s employees are corrections officers (prison guards). The other half includes not only parole and probation agents, along with managers and administrative support, but social workers, teachers and medical personnel. Within and alongside a prison system, the department runs healthcare, job-training, and social-service systems. The state attempts to help prisoners with their re-entry into society. But so do religious and secular groups such as Prison Fellowship and the Safer Foundation. Commercial firms such as Corrections Corporation of America and Cornell Corrections build and operate entire prisons for other states, often providing higher quality at a lower cost. These private-sector companies could run similar operations here. In New Mexico, 44 percent of prisoners are incarcerated under private management. In Michigan, less than 1 percent are managed privately.